The Puzzler was a weekly periodical which ran for 14 issues from 26th October 1933 to 25th January 1934. 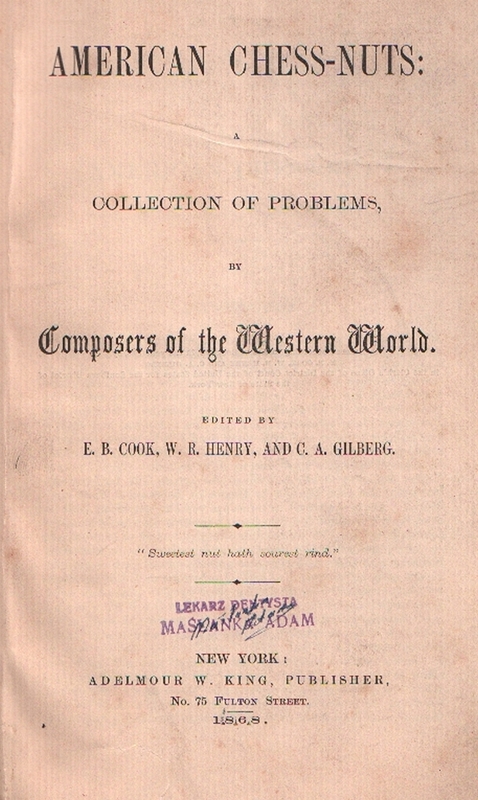 It was published by Thomas de la Rue & Co. Ltd. of London in a large format measuring 33cm x 23cm. 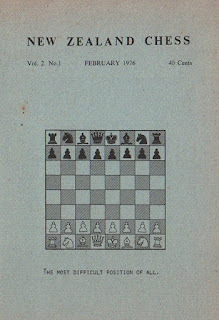 Betts 42-7 records this short lived publication in the Problems, Periodicals section, although the chess content is meagre. 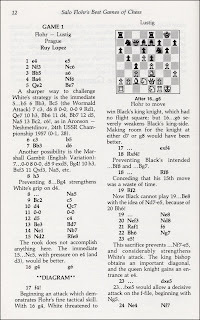 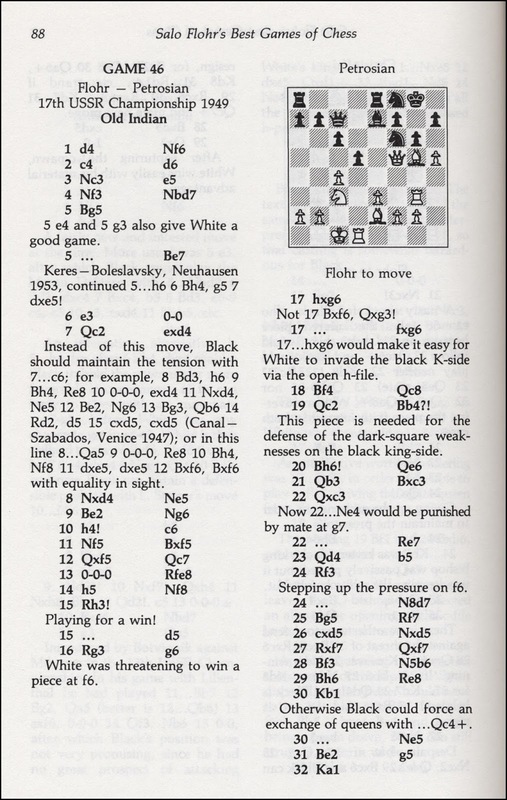 Betts does not name the publisher but notes that each issue had 16 pages with 2 pages devoted to chess problems. 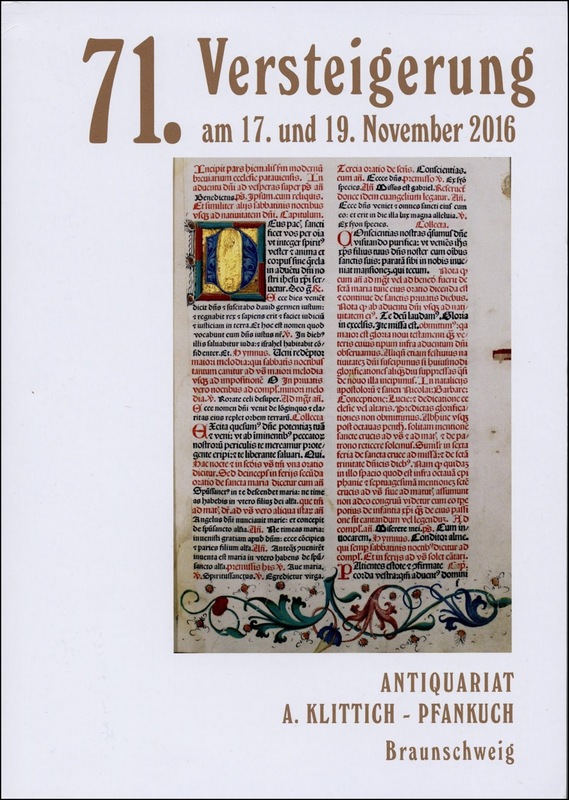 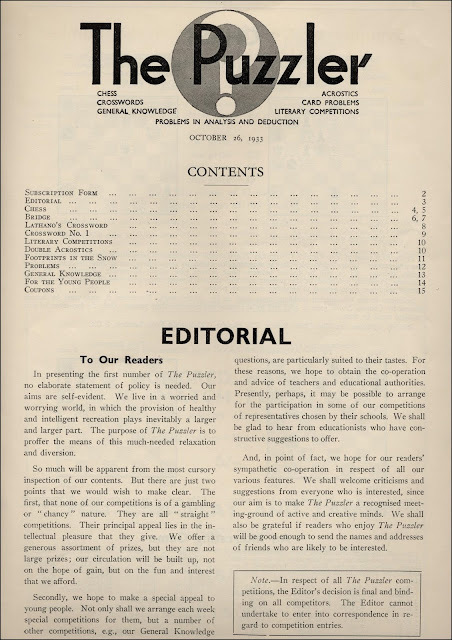 Betts also states that the editors' names were not given and that the issues were unnumbered, however, the first issue is clearly numbered. 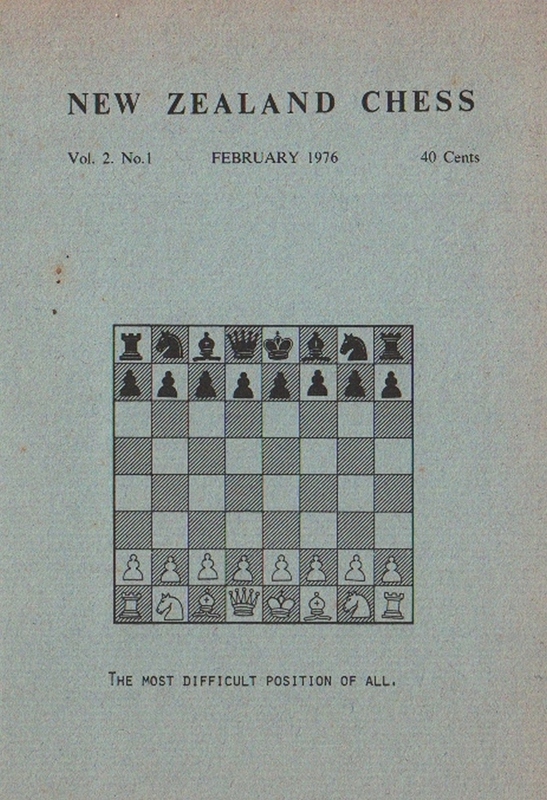 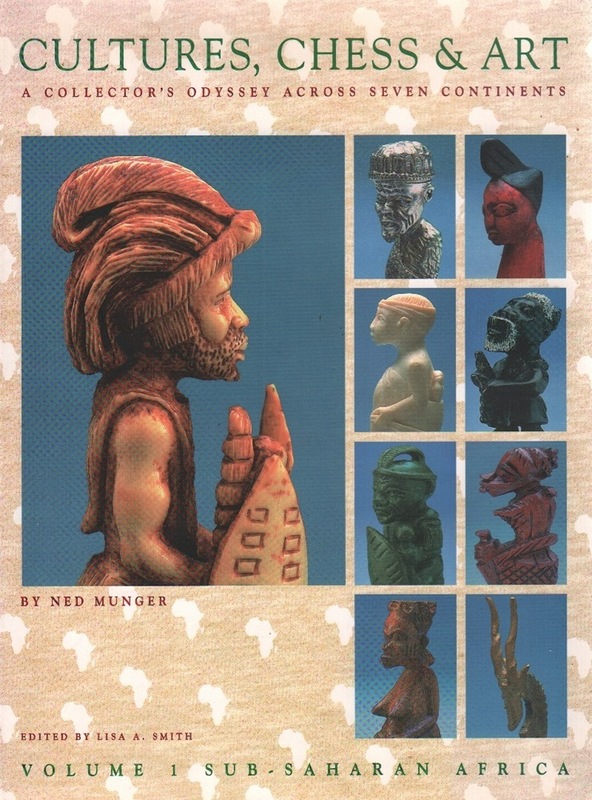 Chess Periodicals by Gino Di Felice records this at no. 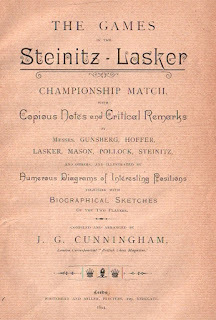 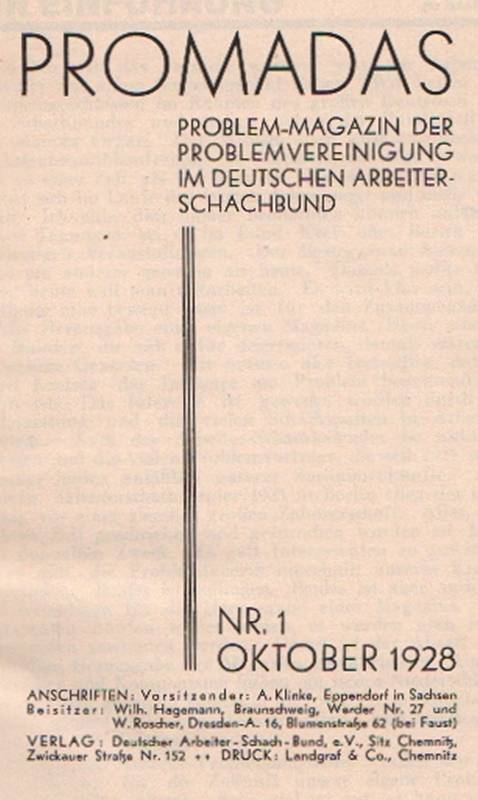 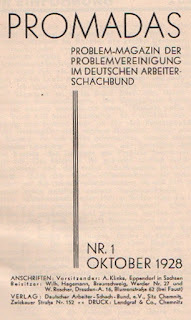 1910, stating that the publisher is unknown and repeating the information from Betts. 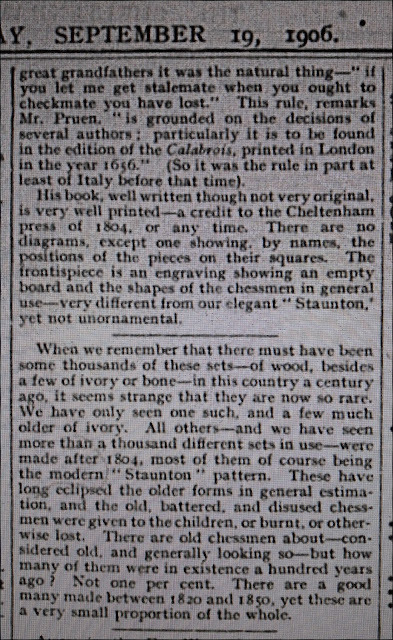 Di Felice also states "no availability found." 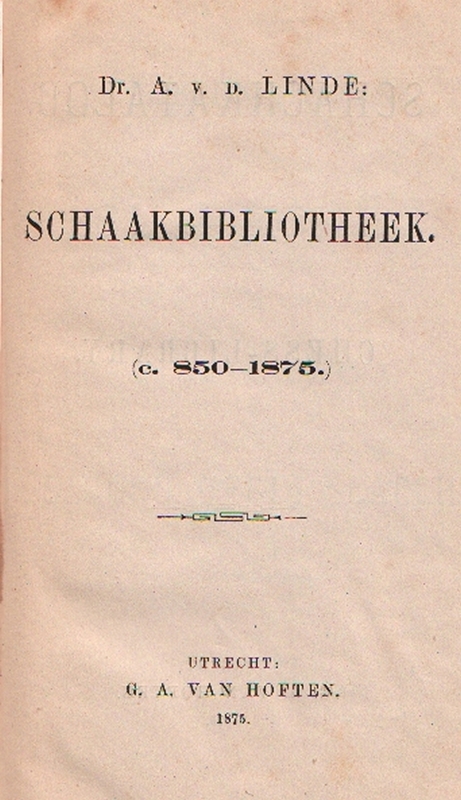 However, complete runs of this periodical can be found in The British Library, The National Library of the Netherlands and The Cleveland Public Library, although, curiously, none of them names the publisher. 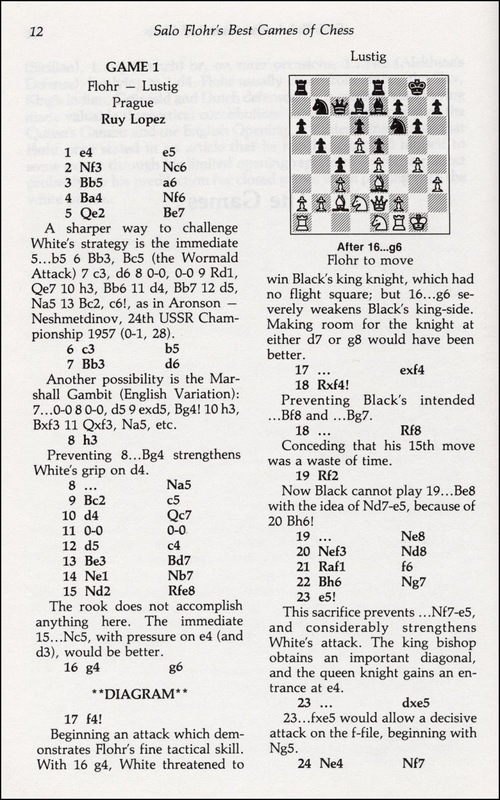 The Puzzler is also recorded in Chess Columns: A List by Ken Whyld who adds that it was succeeded by The Sphinx at Play with Comins Mansfield as chess problem editor. 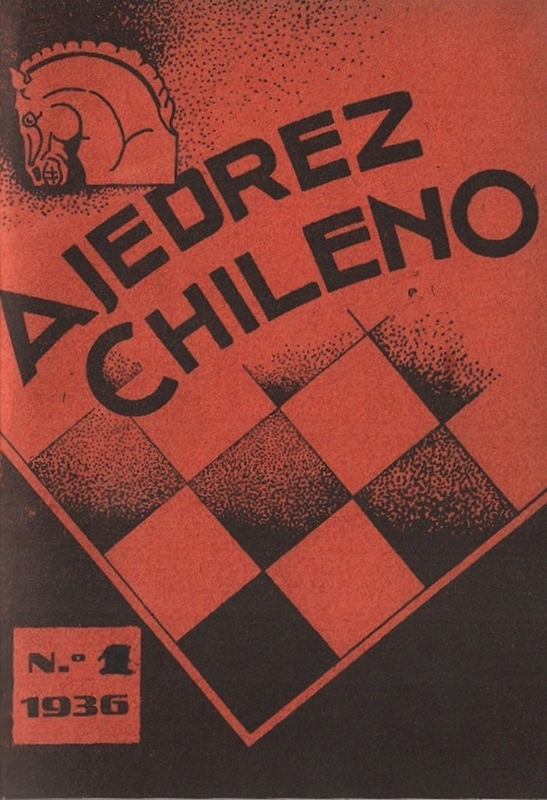 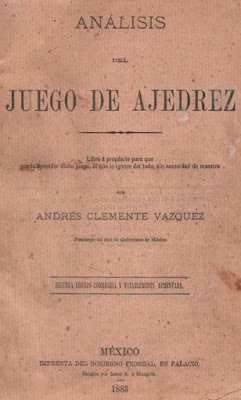 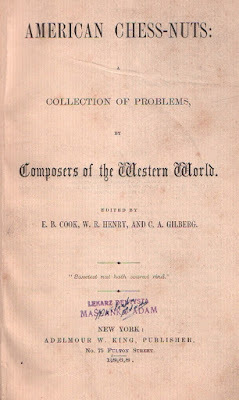 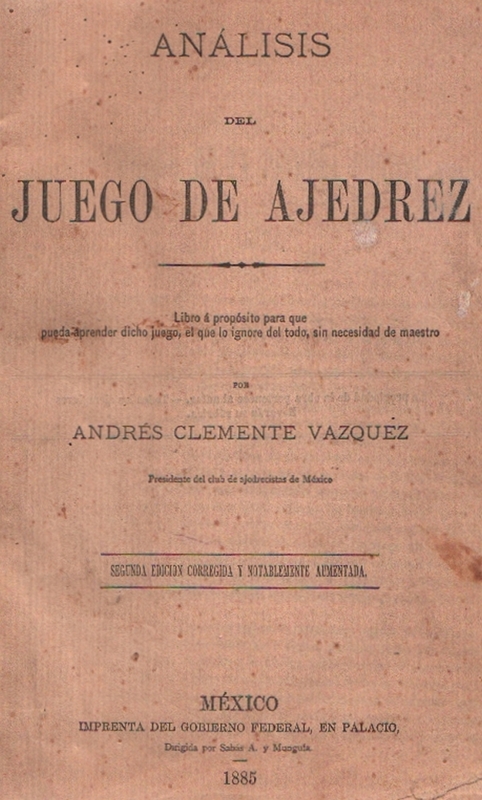 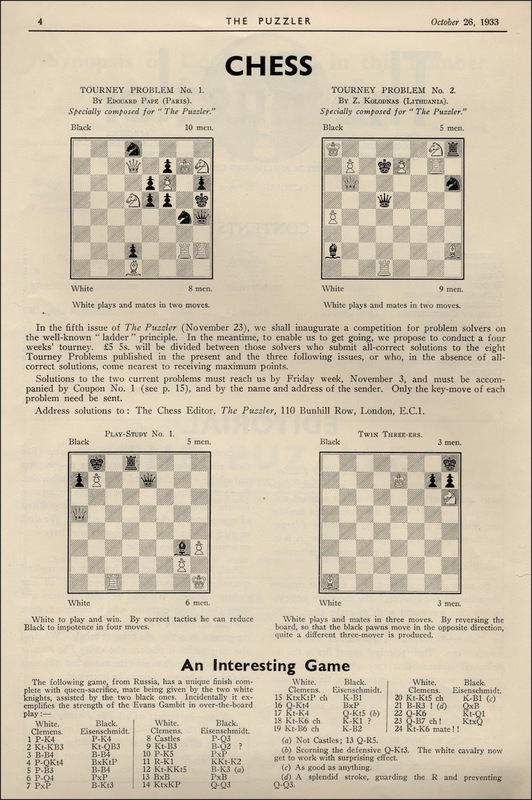 The chess content in the first issue consisted of problems by Edouard Pape and Z. Kolodnas, both specially composed for The Puzzler, details of a competition for problem solvers, a Play-Study and a Twin Three-er. 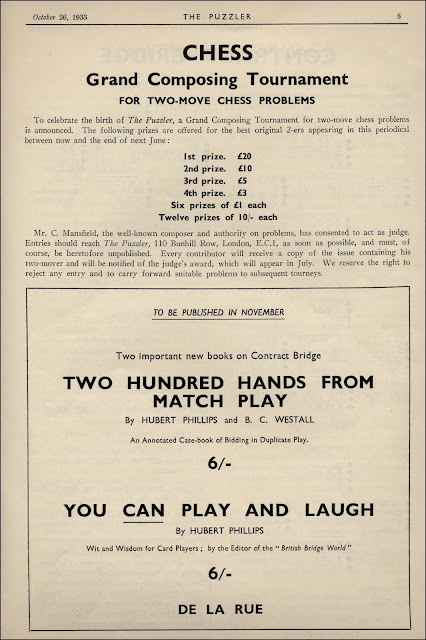 An Interesting Game, from Russia, is given between Clemens and Eisenschmidt, and the second page announces a Grand Composing Tournament for two-move chess problems to be judged by Comins Mansfield. 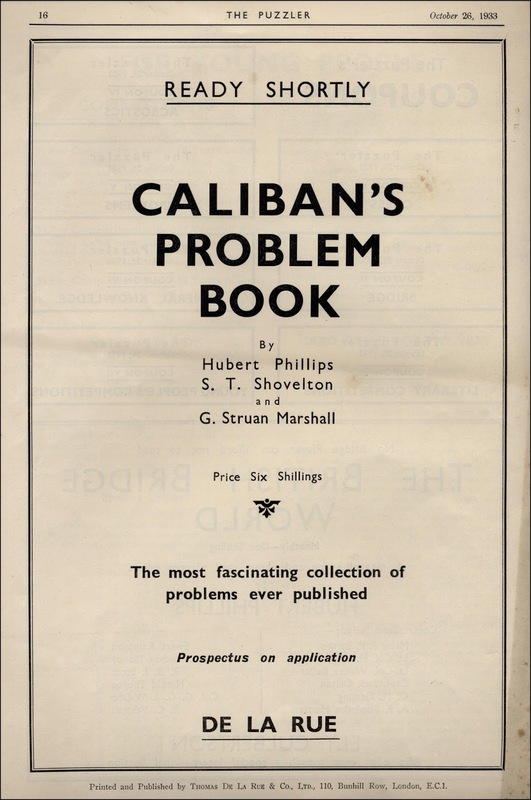 While no editors are named, there is a strong connection throughout issue one with Hubert Phillips, the prolific author of books on problems and puzzles. 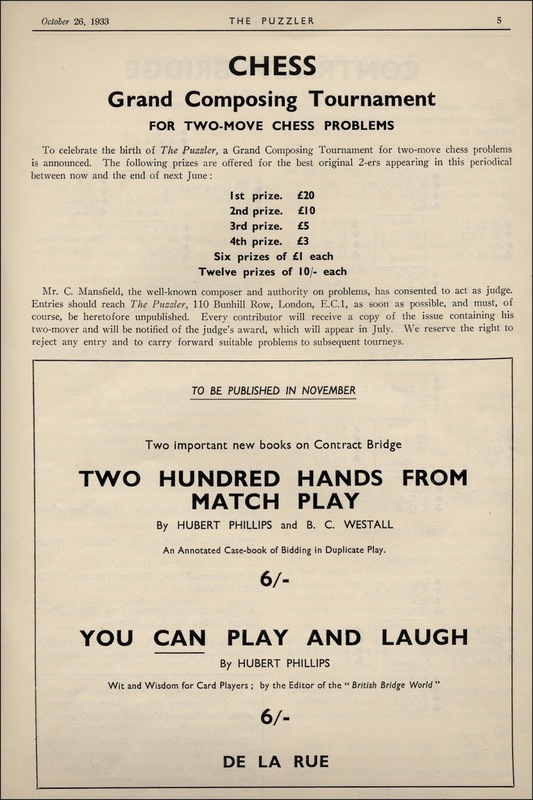 There is a long contribution from Phillips in the Contract Bridge pages, the Footprints in the Snow problem, which takes up another page, is from Phillips' 1932 publication The Week-End Problems Book, and four of the large adverts, including the whole of the back page, are for works by Phillips. 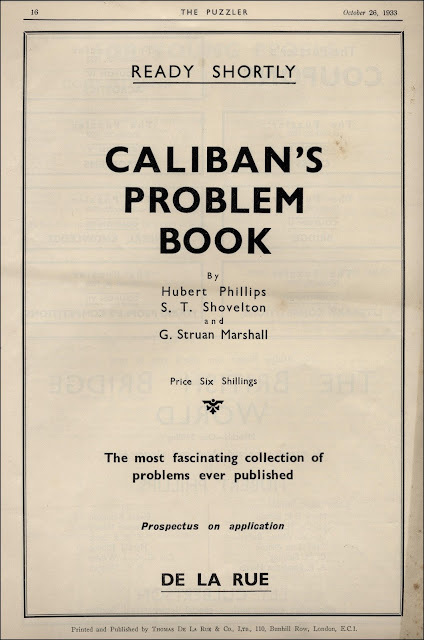 I only have the first issue of this magazine; the vendor from whom I purchased this collected only the first issue of each periodical and no others! 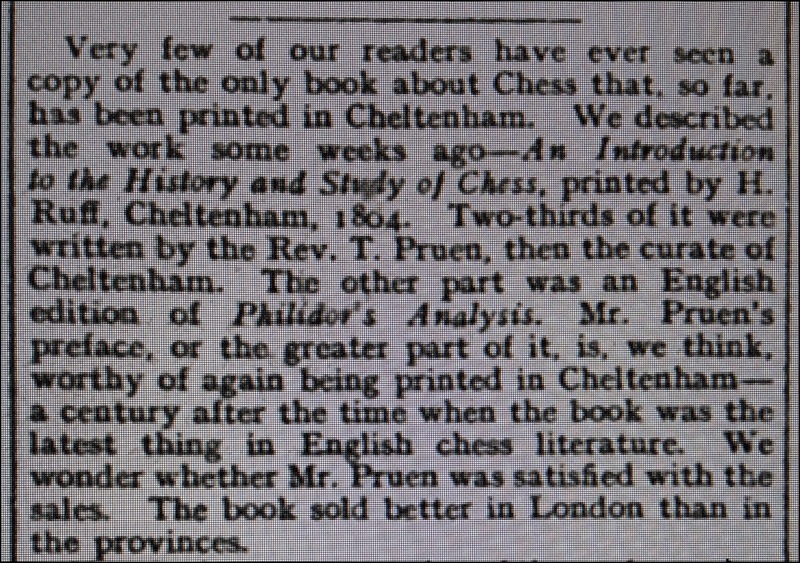 W. S. Branch (1854 - 1933) was the evergreen chess columnist in Cheltenham newspapers for over 40 years from 1890 to 1933. 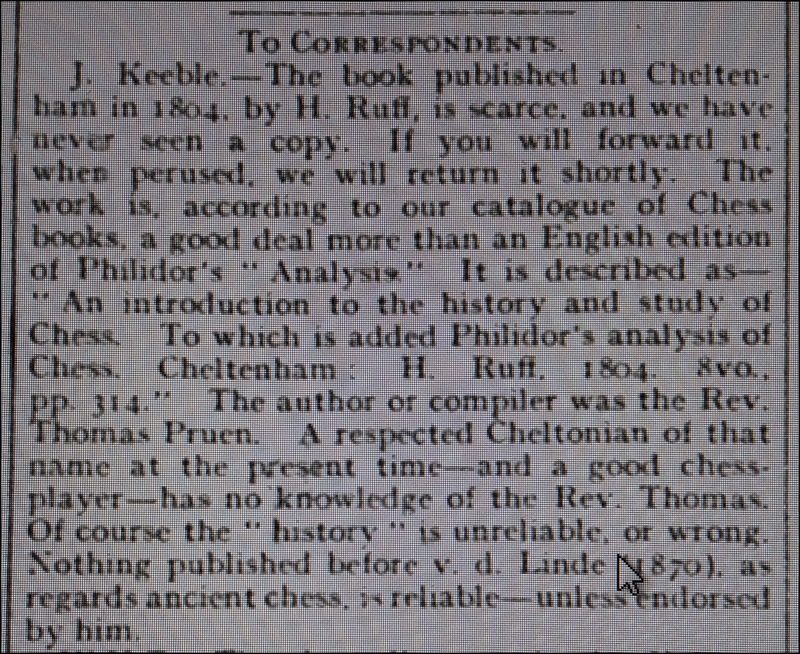 He conducted the chess column in The Cheltenham Examiner from 1890 to 1913 and then in the Cheltenham Chronicle from 1914 up to his death in January 1933. 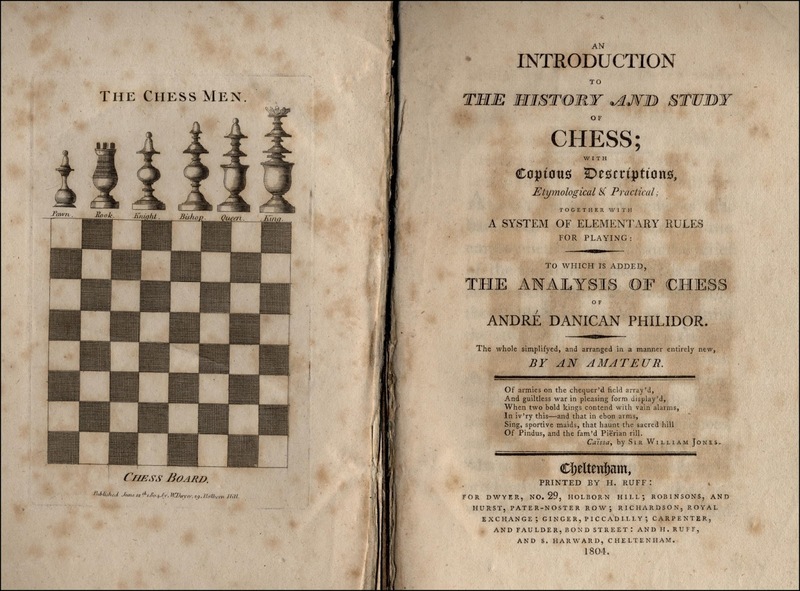 Branch's chess columns reflected his special interest in the history and literature of the game and, having recently leafed through some of these newspapers, I can report on some matters of interest to chess bibliophiles. William Shelley Branch was born in Hastings in 1854 (Shelley was his mother's maiden name). 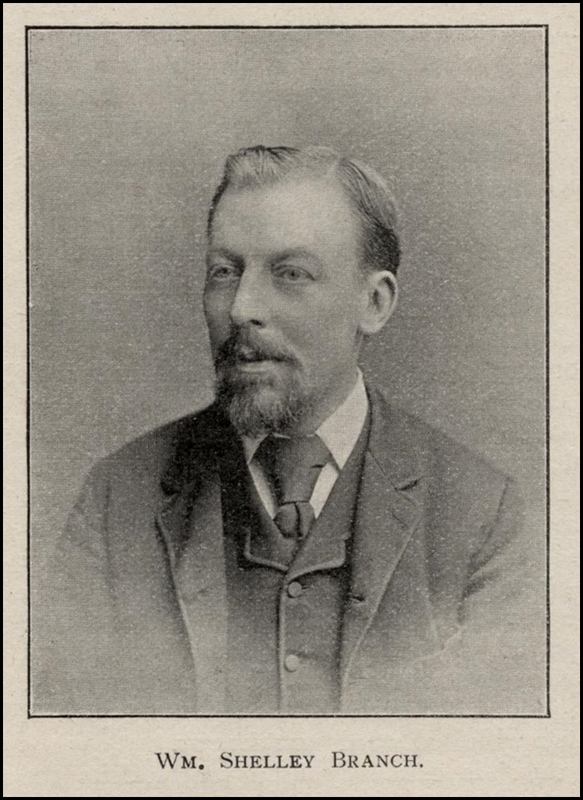 He was a professional photographer in the 1870's and 1880's in Lewes, Sussex and continued this profession when he moved with his family to Cheltenham in 1888, although he appears to have given up photography for journalism in the mid 1890's. 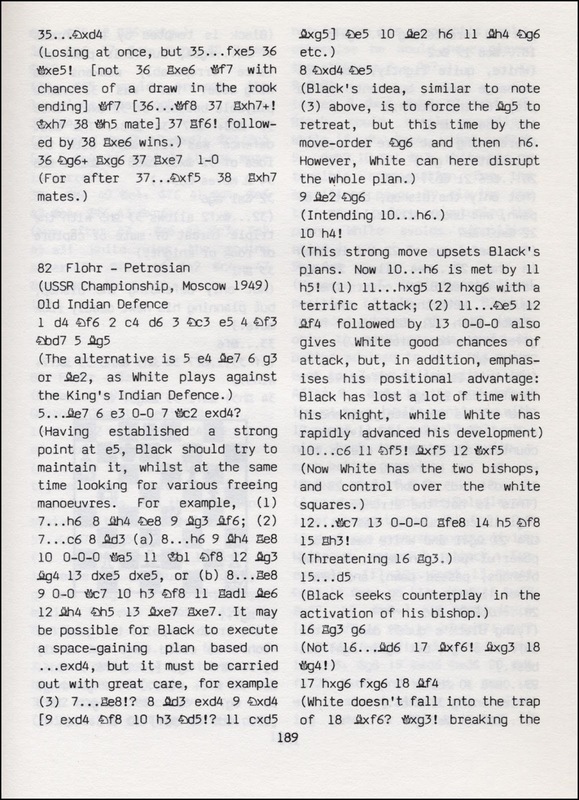 Branch was one of those indispensable, but often under appreciated, chess organisers. 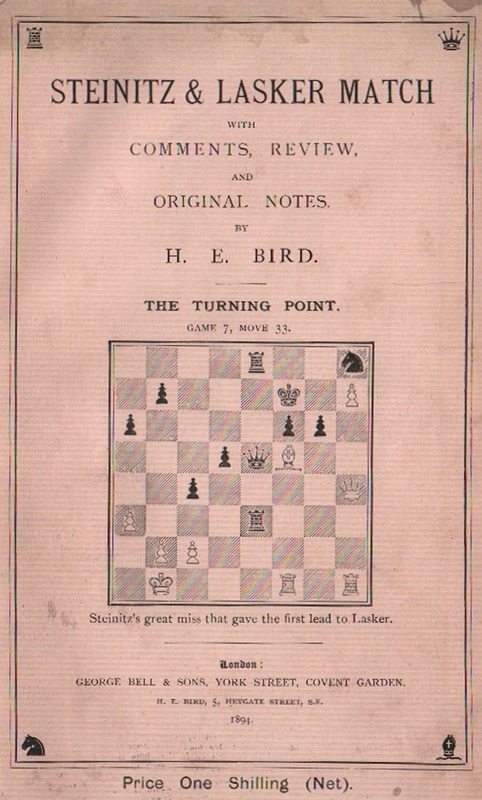 He helped to form chess clubs in Brighton and Lewes and re-established the Cheltenham chess club soon after his arrival in the town. W. S. Branch took over the reins of the chess column in The Cheltenham Examiner in November 1890 when Isidor Gunsberg, the previous incumbent, sailed to New York for his World Championship match with Steinitz. 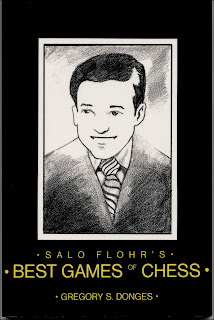 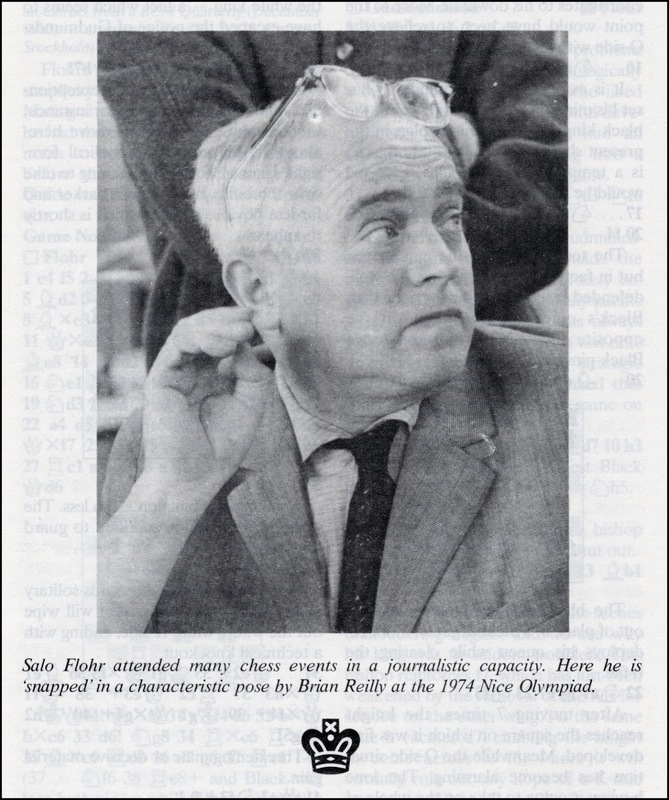 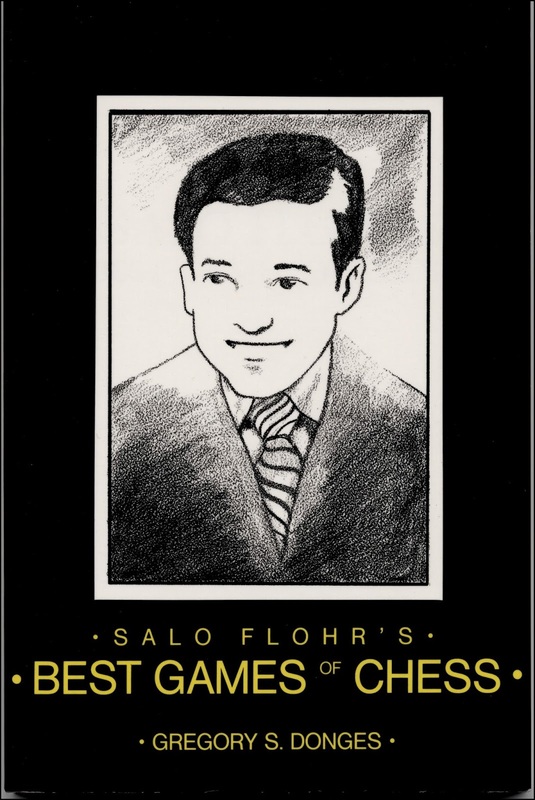 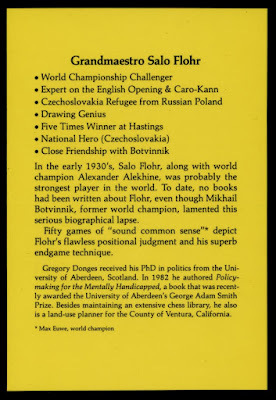 The columns initially consisted of local reports, a game and a problem, but these eventually expanded to include anecdotes and biographical information about chess personalities. 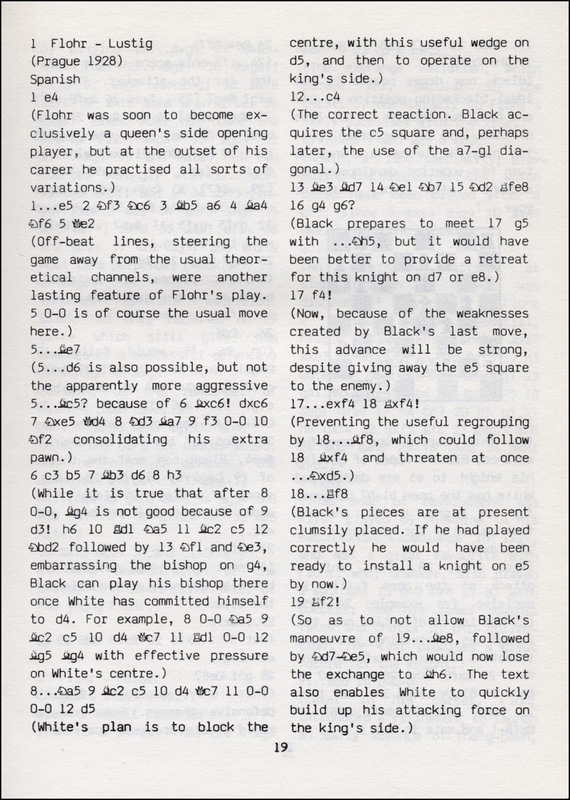 Later articles would often cover two or three full columns of the broadsheet newspaper and commenced with a chess related poem followed by a problem or two, (occasionally one of Branch's own creations), local news and results, answers to correspondents and a game. 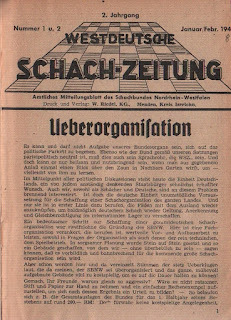 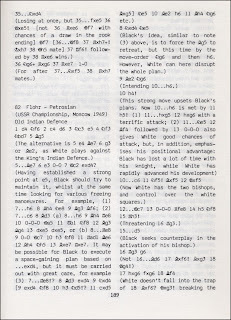 Chess intelligence from other papers and periodicals, including American publications, also frequently appeared. 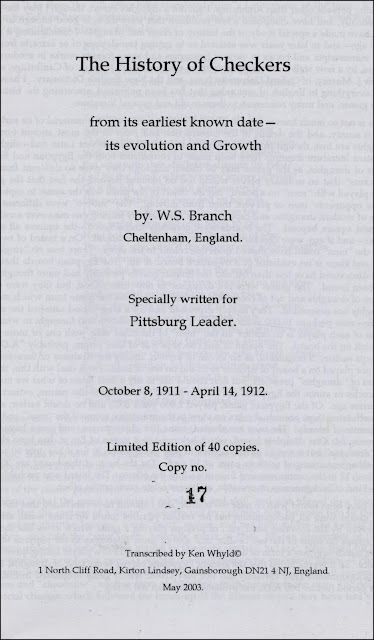 Branch was in his element in answering questions from correspondents of a historical nature, and would often reply at great length to get to the root of the matter. 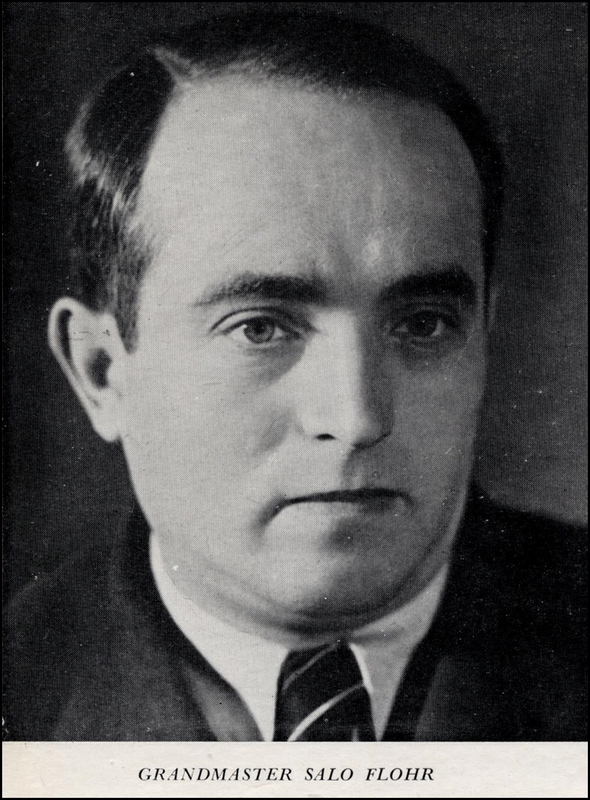 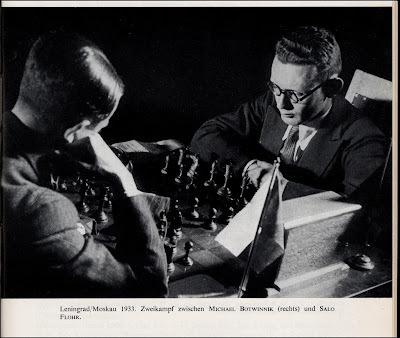 W. S. Branch was a highly respected historian at the time; John Keeble declared that he had a greater knowledge of chess history than any other man, with the exception of H. J. R. Murray, in his obituary in The British Chess Magazine in March 1933. 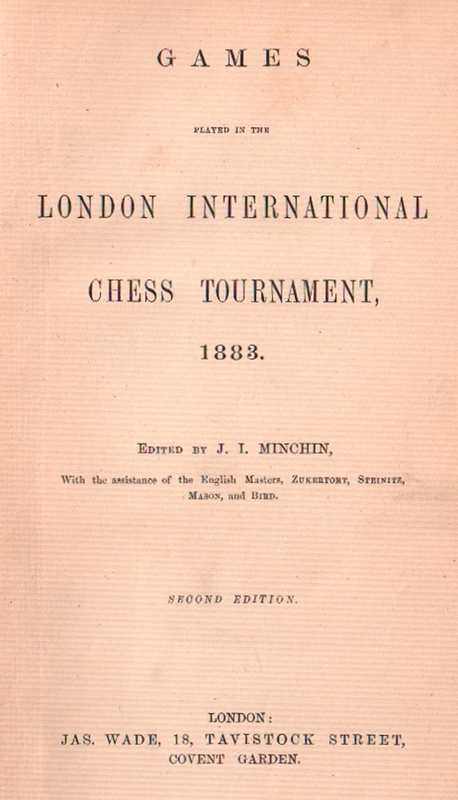 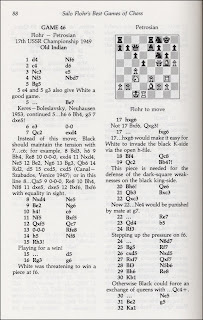 Branch contributed a detailed history of chess in a series of eighteen articles to The British Chess Magazine in 1899 and 1900 entitled A sketch of chess history before the second revolution. 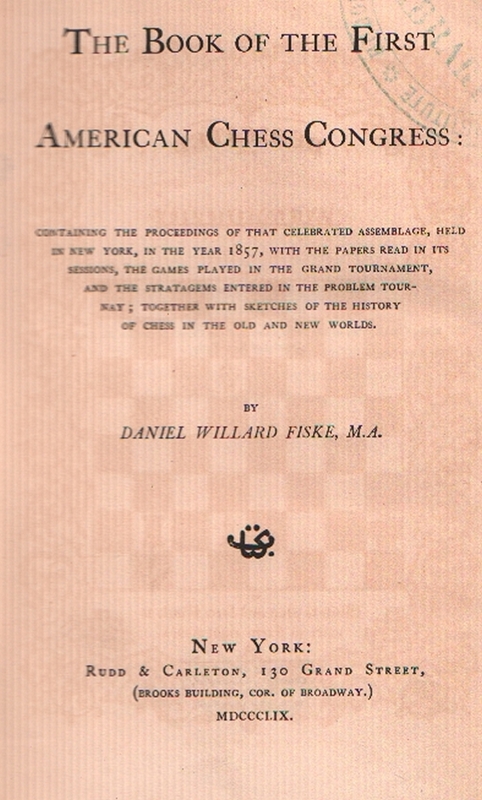 This covered the history of chess from its origins in the sixth century up to around 1475. Branch was also a draughts expert and wrote a series of articles entitled The History of Checkers for the Pittsburg Leader in 1911 and 1912. 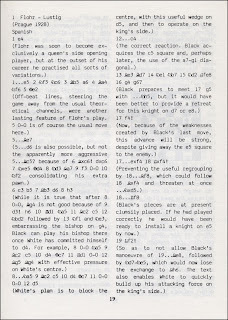 These were reprinted in pamphlet form in a limited edition of 40 copies by Ken Whyld in 2003. The Cheltenham Examiner column for 29th August 1906 included a note to correspondent J. Keeble regarding An Introduction to the History and Study of Chess, by an Amateur, published in Cheltenham in 1804. 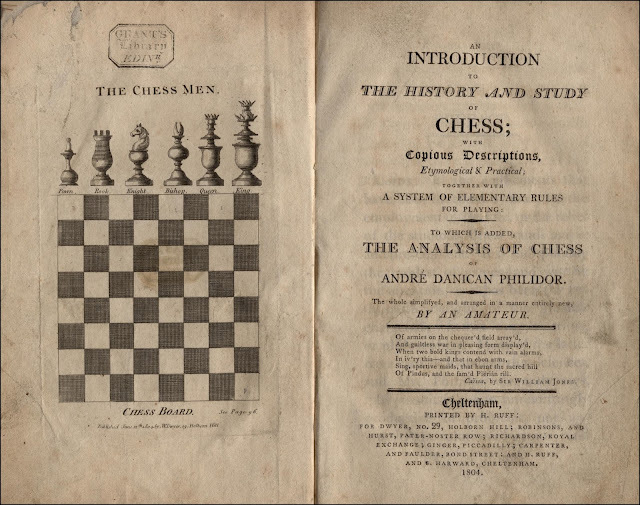 Branch admits to never having seen this work, which must have intrigued him greatly, being a history of chess published in his home town. 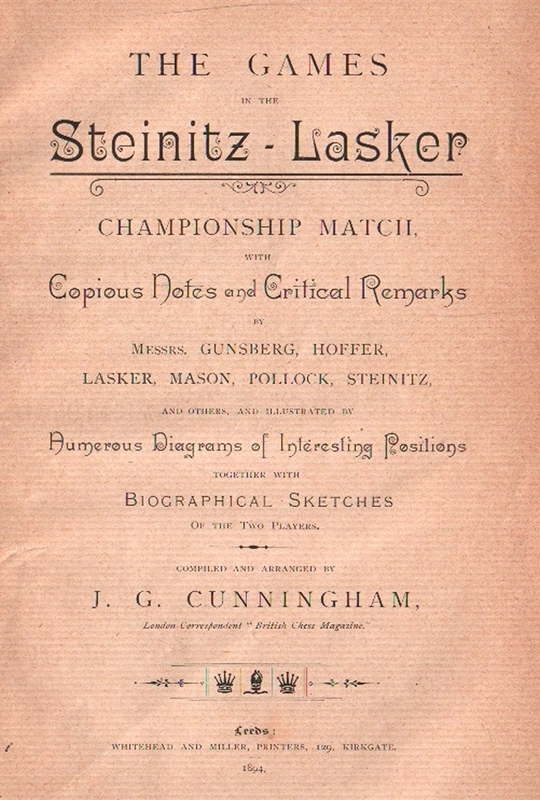 Keeble loaned the book to Branch and, three weeks later, in his column for 19th September he described the book in some detail. 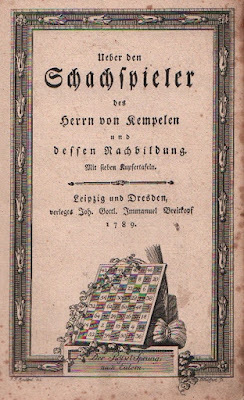 He was aware that the anonymous Amateur was the Rev. 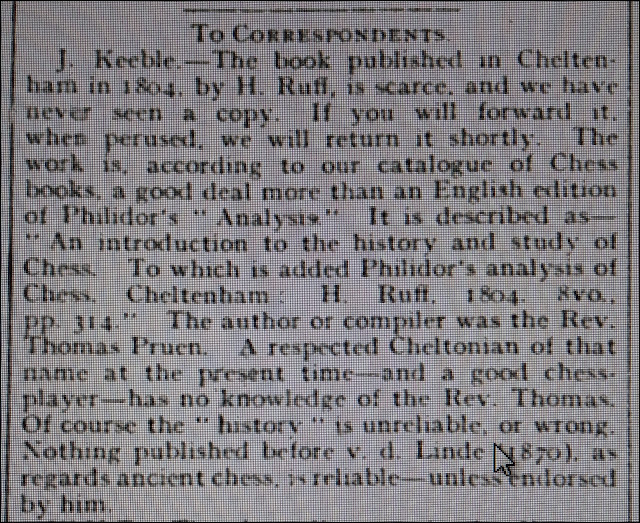 Thomas Pruen, Curate of Cheltenham. 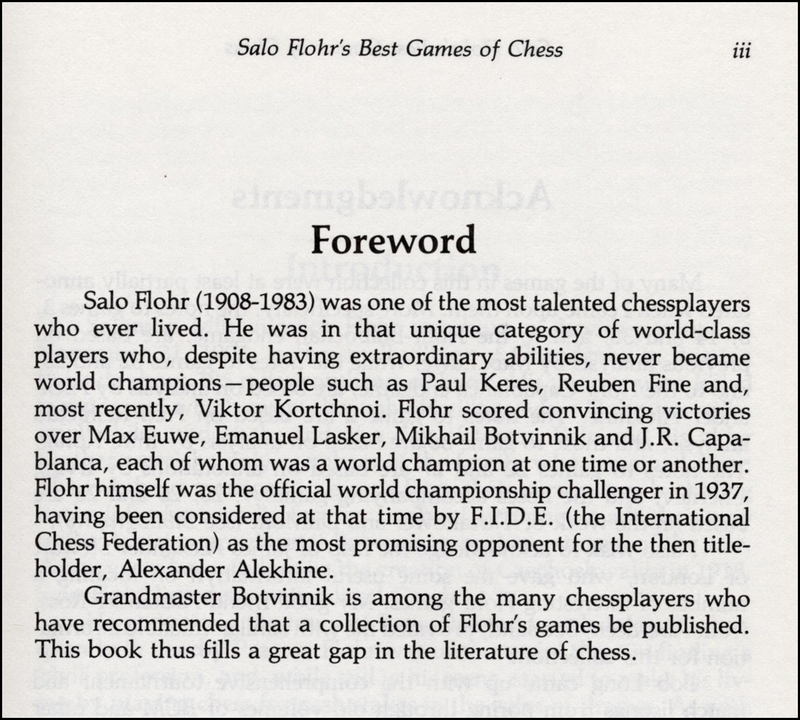 The book was, in fact, the most complete compendium of chess in the English language up to that time. 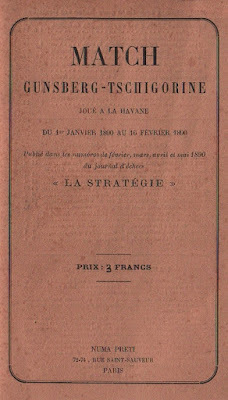 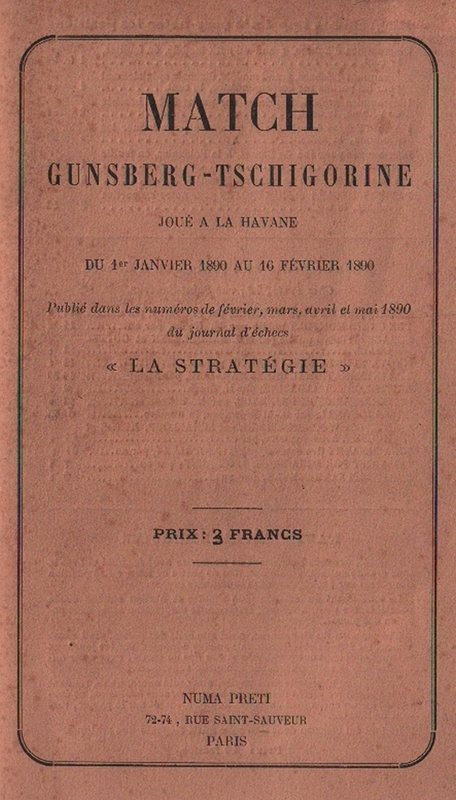 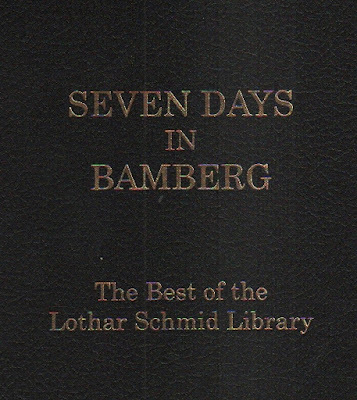 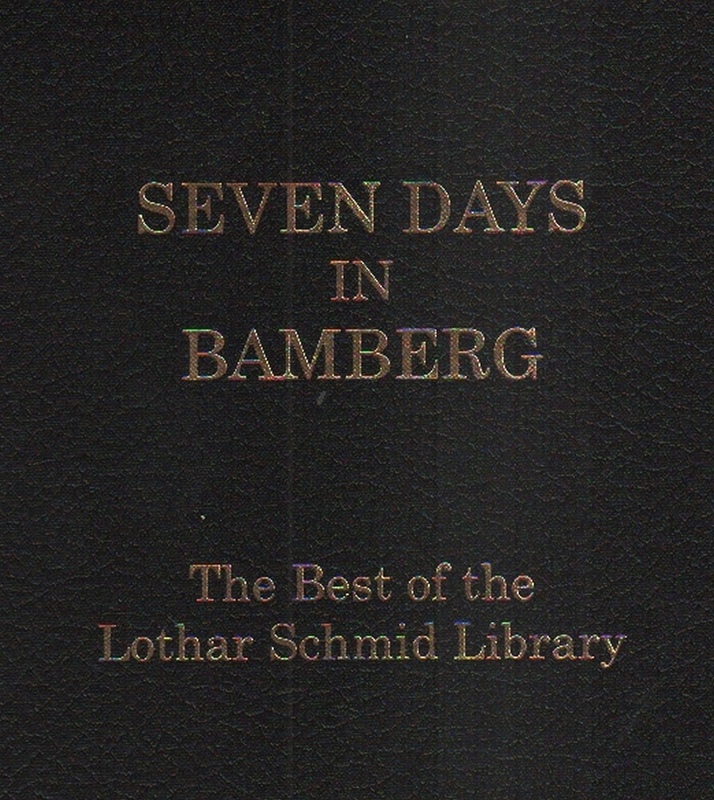 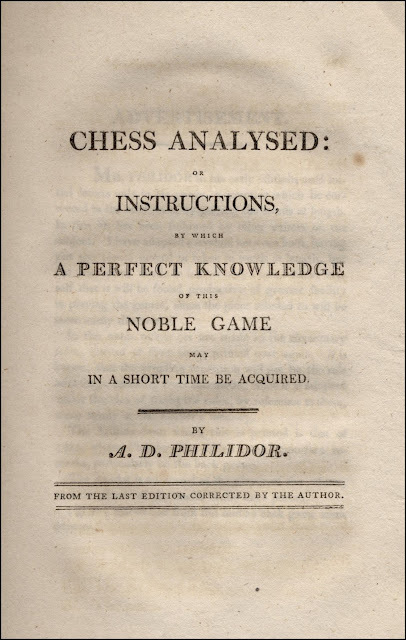 The first three chapters gave a historical sketch together with many anecdotes taken mainly from the two volumes of Chess by Richard Twiss published in 1787 and 1789. 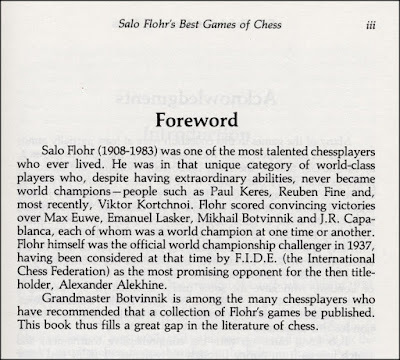 There were brief details of famous chess-players, notably Philidor, and descriptions of the works by Cessolis, Caxton, Ruy Lopez, Carrera, Salvio, Greco, Stamma, Philidor, Lolli, Vida, and Twiss. 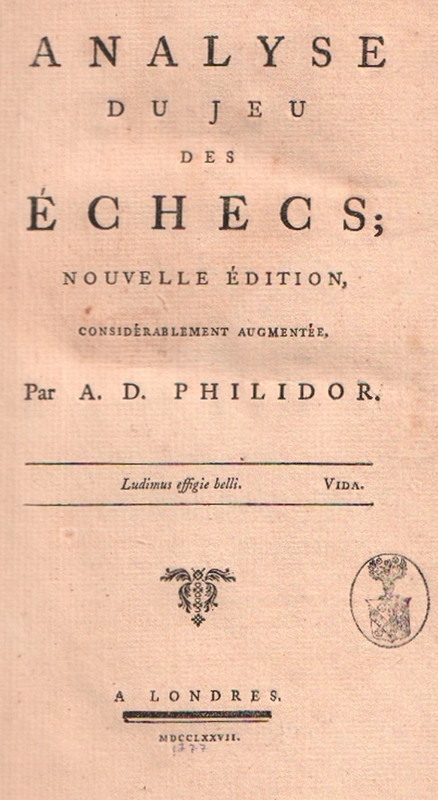 Other early writers were also mentioned in the text. 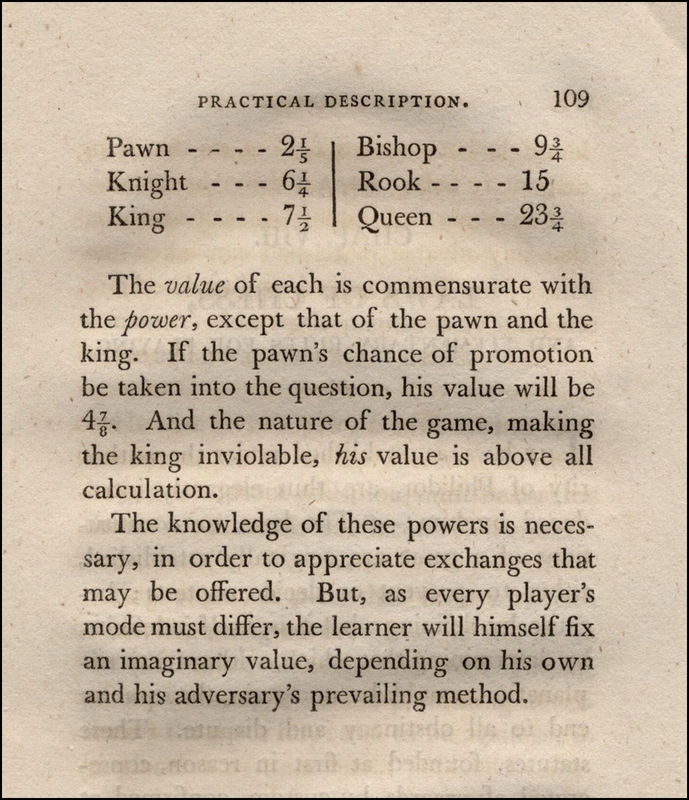 Chapter V included a detailed etymological description of the chess men and an explanation of terms used in the game. 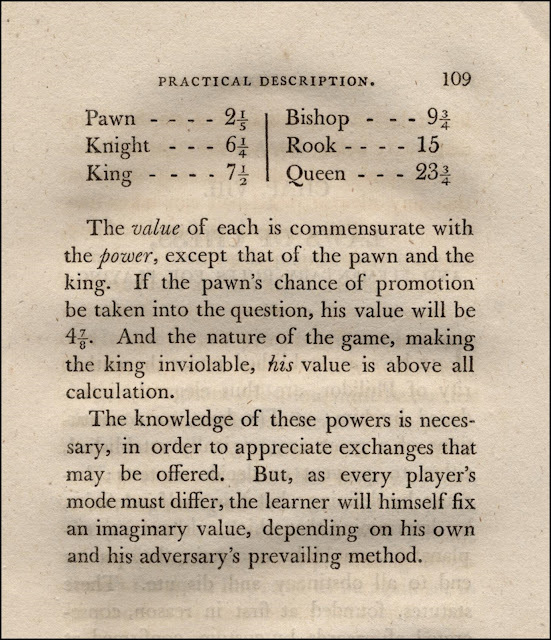 This is followed by Benjamin Franklin's Morals of Chess, then a Practical Description of the game including a table of the relative values of the pieces. 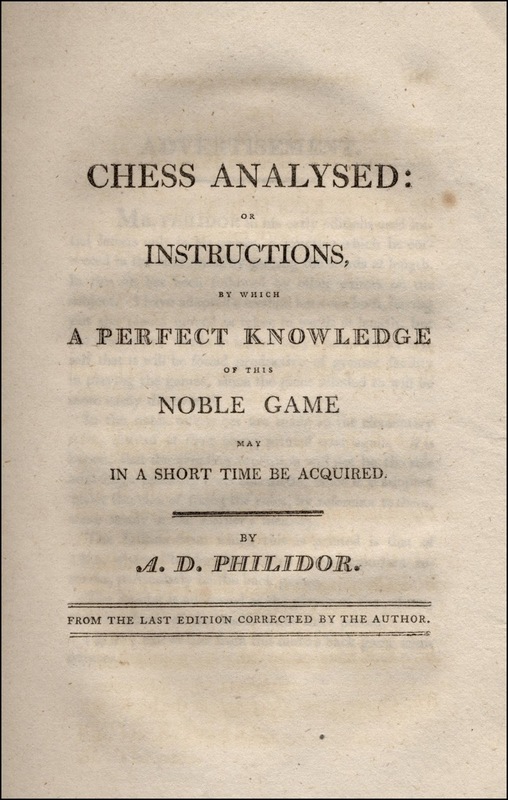 Chapter XIII presents the Laws of Chess as established under the authority of Philidor, rules for playing and general advice. 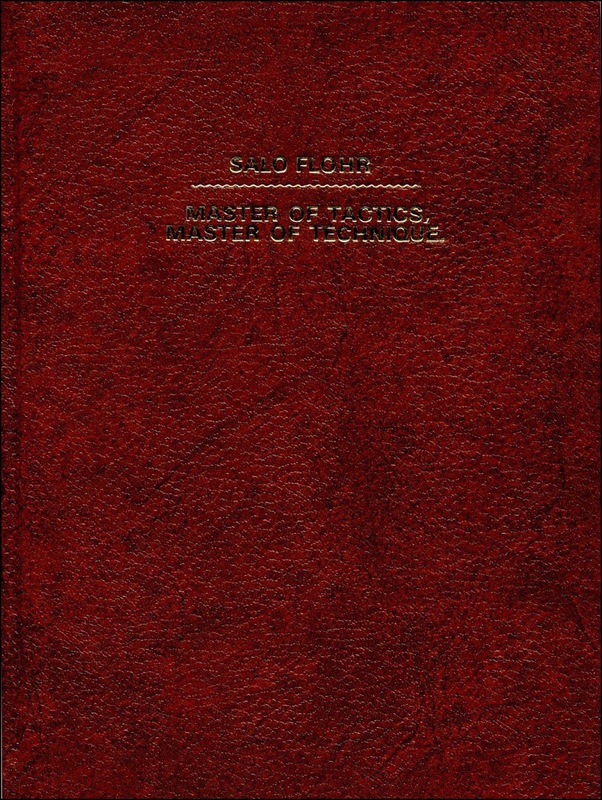 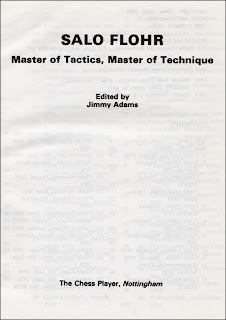 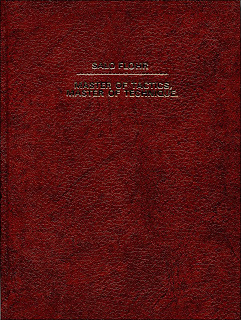 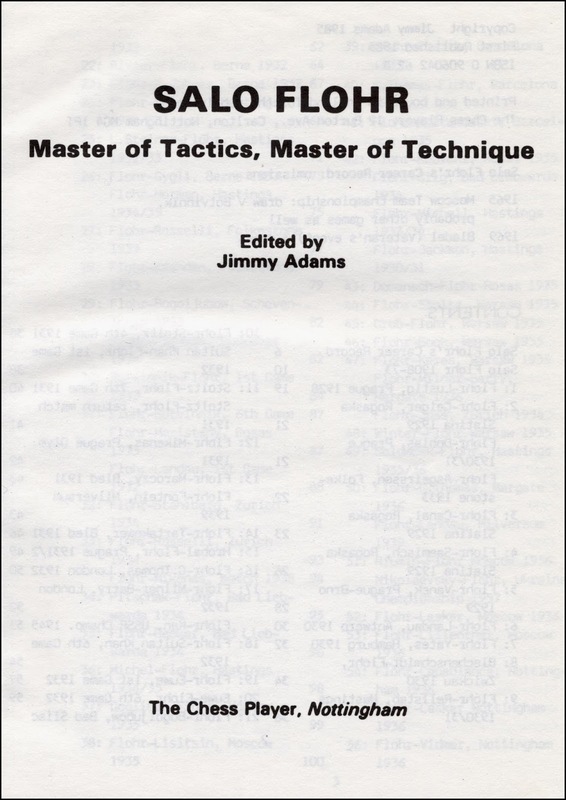 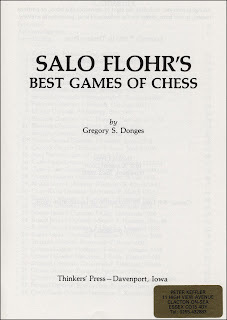 The first part of the book is completed with a few practical examples of beginnings of games and four games from Greco. 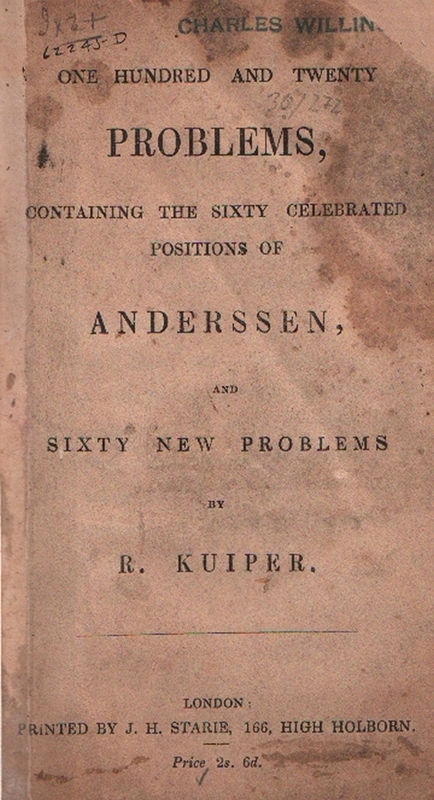 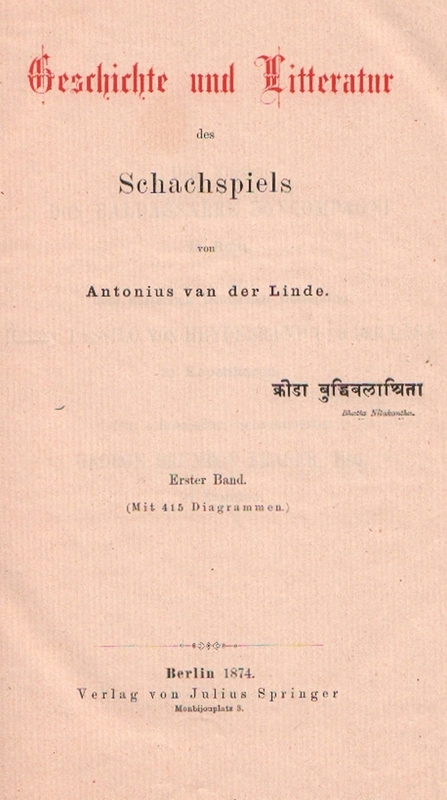 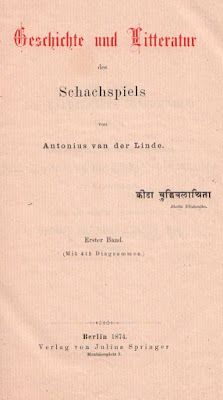 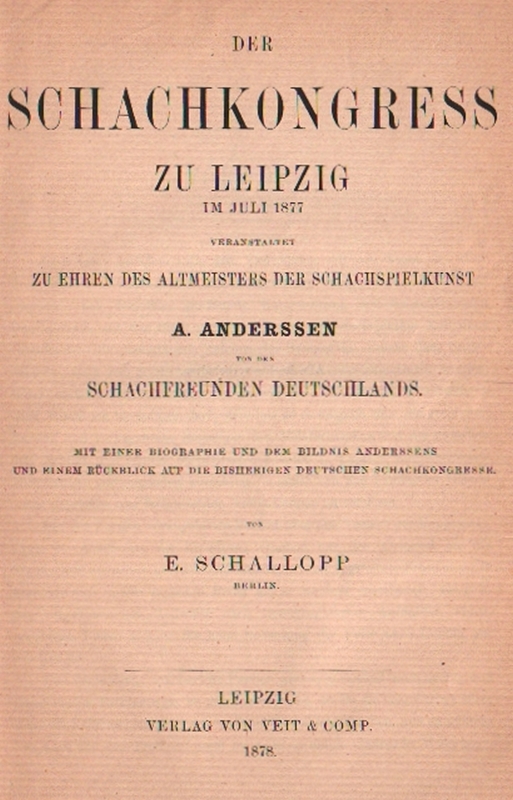 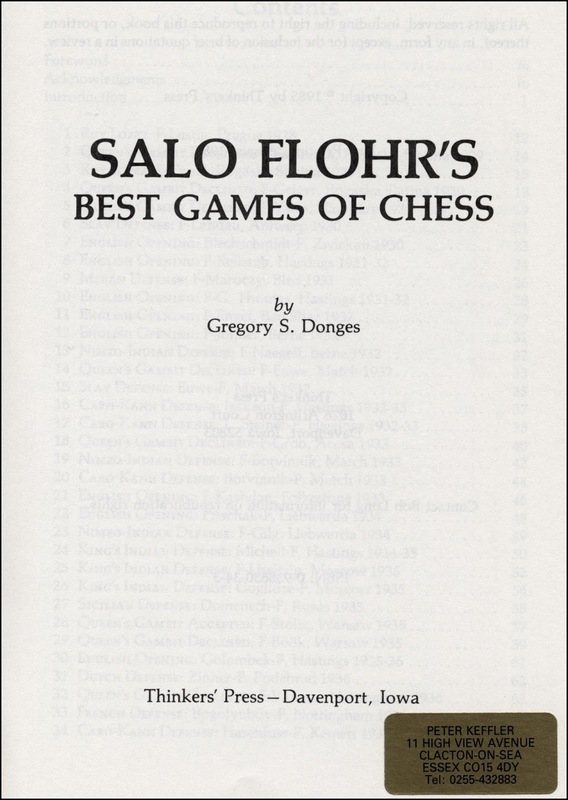 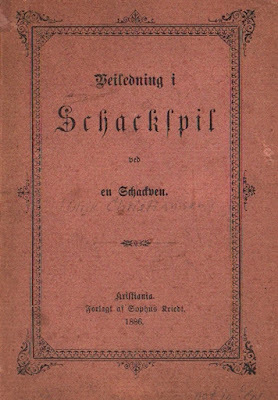 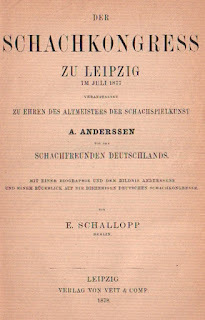 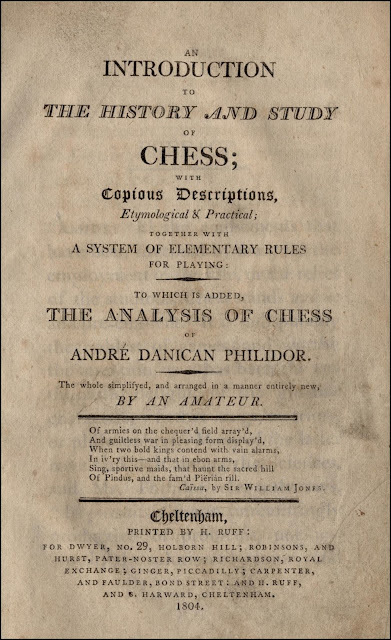 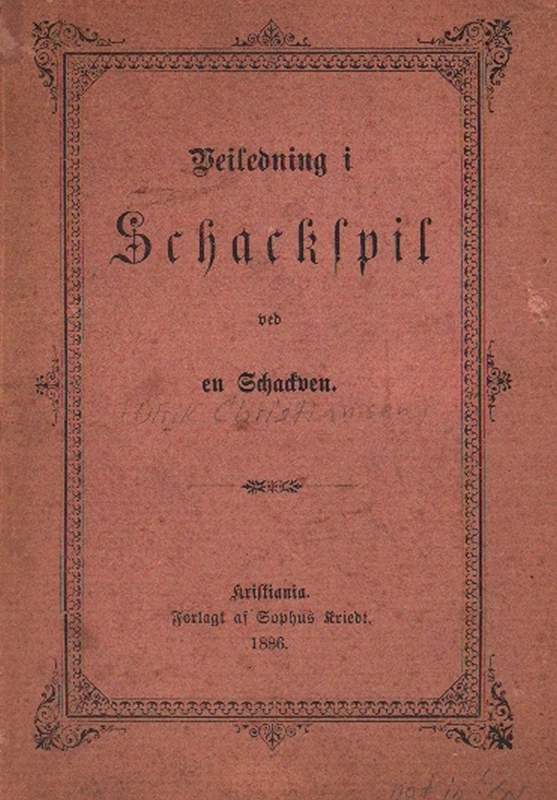 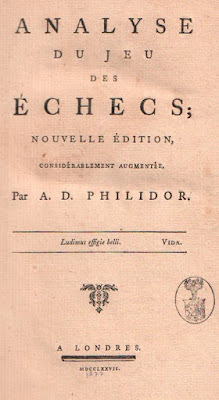 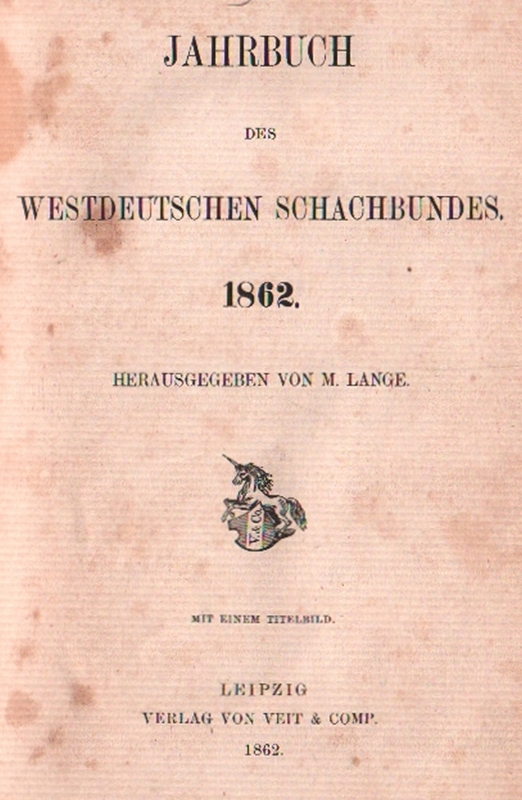 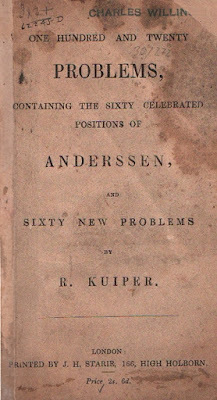 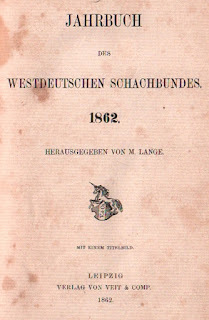 The second part of the book, covering 150 or so pages, had its own title page and consisted of Philidor's analysis taken from the 1791 edition of Chess Analysed. 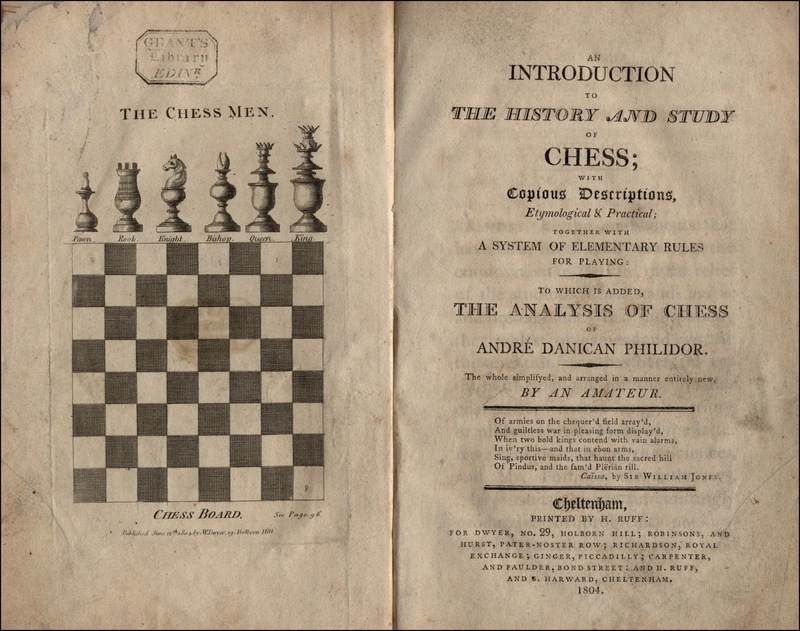 Branch was disdainful of this "very partial analysis of a few openings", claiming that "it is all out of date now and only of antiquarian interest." 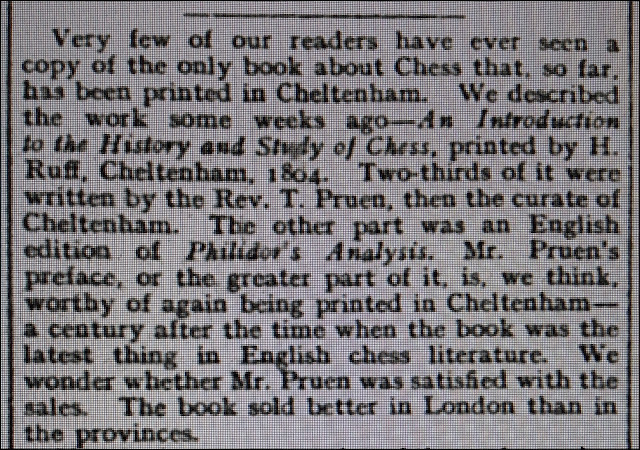 Although rather dismissive of Pruen's book in his column of September 19th, Branch returned to this subject a few weeks later and thought the book worthy of being reprinted, he also commented that the book sold better in London than in the provinces. At the time this was the only chess book that had been printed and published in Cheltenham. 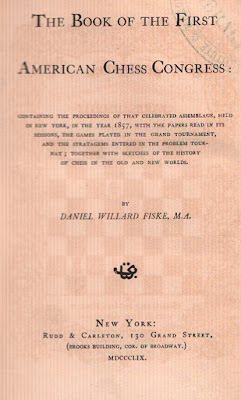 There have since been others including The Fourth West of England Chess Festival published by Gloucestershire County Chess Association in 1928, and W. S. Branch's own book The History of Cheltenham Chess Club, privately printed and published in 1931. 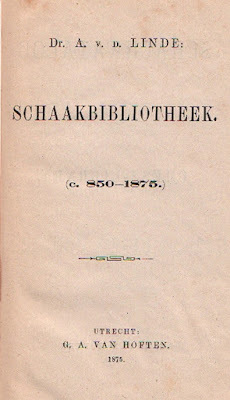 Neither of these rare items is recorded in Betts' Bibliography, nor can they be found in the National Library of the Netherlands. 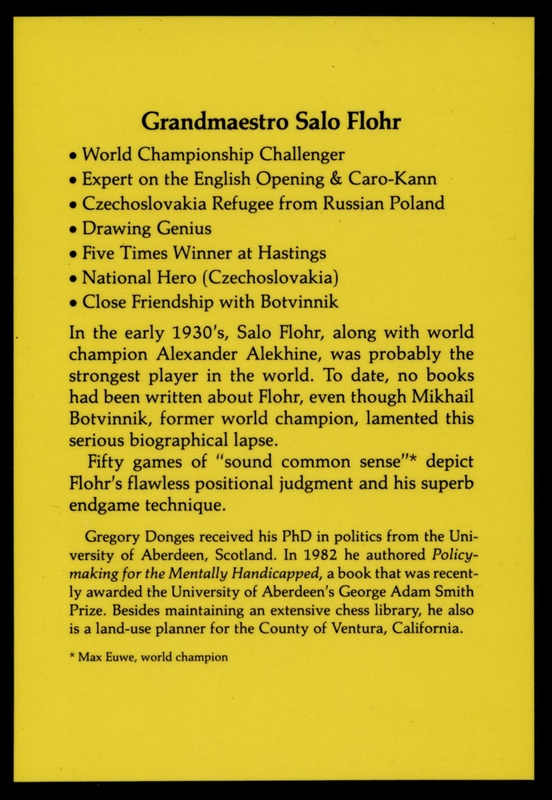 However they are both in the Cleveland Public Library. 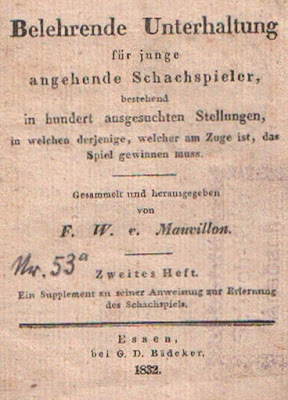 Incidentally, there are two variants of Pruen's book. Note the chess men in the frontispieces below. 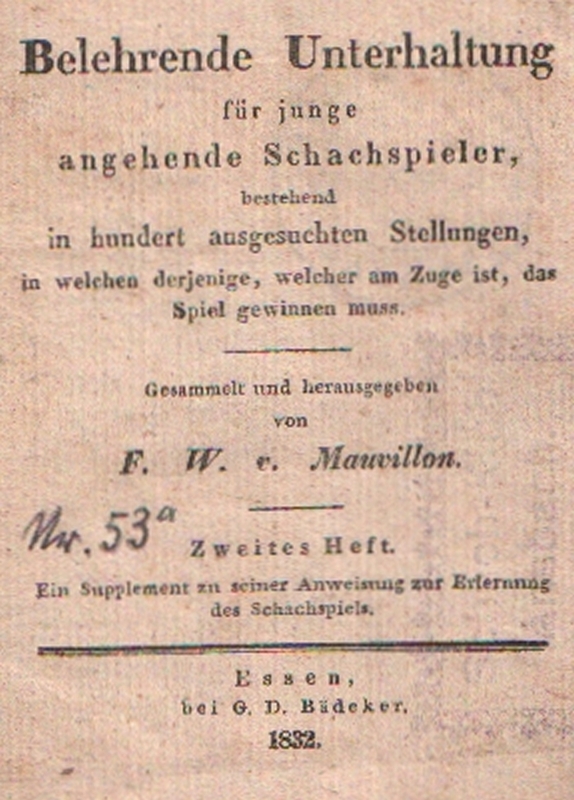 Both give the same publication date of June 12th 1804. 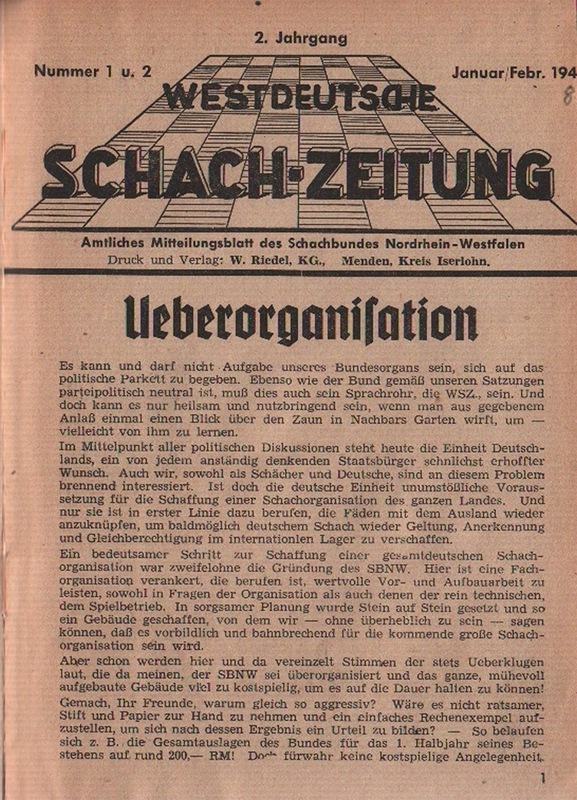 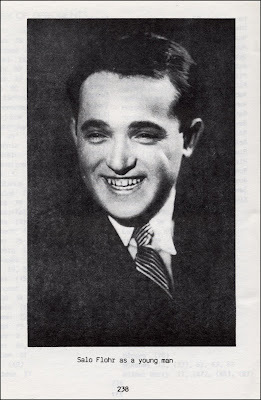 The British Chess Magazine, March 1933 pages 117-118, obituary by John Keeble. 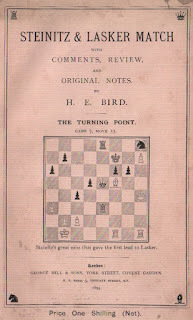 Professional and Amateur Photographers in Lewes (A-B), from the website www.photohistory-sussex.co.uk.